That “Leave” won Thursday’s referendum has been seen as an indictment of the United Kingdom’s whole political system. Fully 51.9% of voters elected to begin the process removing Britain from the European Union, marking the first time any member of the EU has voted to leave. This result flew in the face of betting markets — and, in turn, financial markets — which had long discounted that the Leave camp would ultimately prevail. Leaving the EU was supposed to be a vote into the abyss. The big lie, of course, is that we ever had anything like certainty about the future to begin with, and that only an idiot could prefer the unknown over defending the status quo. In hindsight it is now obvious that David Cameron committed political suicide by allowing this referendum to take place. The vote was simply the result of a campaign promise he chose to make good on, and actually honouring the pledge shows the brashness of Cameron’s belief that elite consensus would rule the day. So an appealing explanation now is to argue Leave voters were simply too ignorant to understand what they were voting for. It came quickly. Demonizing the Leave camp were stories that emerged on Friday showing Google search results for “What is the EU?” spiked in the hours surrounding the results of the vote being revealed. But on further investigation, the gross number of searches for this question were in fact quite few, perhaps less than 1,000 in total. In contrast, 33.5 million people voted in the referendum and over 17 million people voted to leave. Leave voters, it seems, were not as stupid as we would like them to be. Voting for a future of obvious unknowns is what you do when the other option is presented with more bad faith than the decision to choose chaos. As my colleague Lianna Brinded noted in a great column out Monday, UK voters were made well aware of what they were voting on in warnings from authorities ranging from the IMF, to the UK Treasury, to the OECD, and numerous major banks. This was not an ignorant vote. Of course, underpinning both the UK’s Brexit vote and the rise of Donald Trump is an obvious xenophobia and racism that threatens to more fundamentally fracture both nations more than any negative economic consequences. The politics of change have also emboldened the politics of racism: there are no clean hands. The US election, not coincidentally, has been framed as a battle between something like good and evil, smart and dumb, right and wrong. Former Wall Street trader turned photojournalist Chris Arnade wrote in May that we ought to stop treating Donald Trump’s supporters as “complete idiots.” Arnade uses a simple options model to explain how those voting for Trump — much like those who voted to Leave — could be motivated by their current circumstances. If you’re currently screwed in the US or UK — a union worker who has either lost their job or seen wages go nowhere in the wake of mass de-unionization, or a state employee facing certain pension reductions — Leave and Trump alike are call options on the future. Your downside risk is that nothing changes. But the upside, if a new direction for government actually does change something, provides a chance for something better. It is this chance that — to many — is worth voting for. 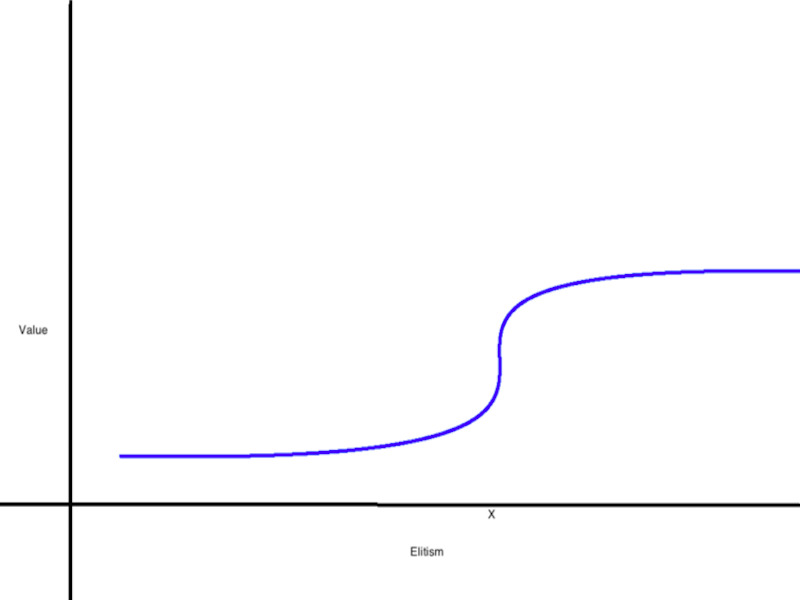 Here’s Arnade’s graph: the further left on the “Elitism” scale you are, the lower your perceived “Value” is in society. 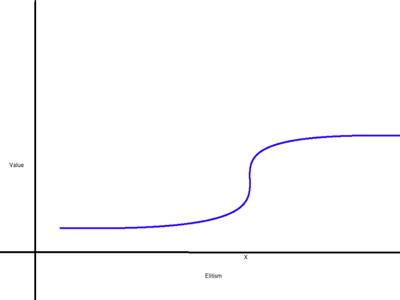 Voting for Trump, like voting for Leave, provides the chance of moving your distribution further to the right of this scale. And if it doesn’t work, oh well: you were going to be stuck on the low end anyway. But this “call option” on the future is, in many cases, really just a hope the US or UK will return to some imagined (read: whiter) past where high-paying jobs and GDP growth were abundant. In a post on Friday, Torsten Bell at Resolution Foundation, a UK-based think tank, wrote that while many people attributed the support for ‘Leave’ to a recent drop in incomes, it was more accurately the manifestation of long-standing trends. 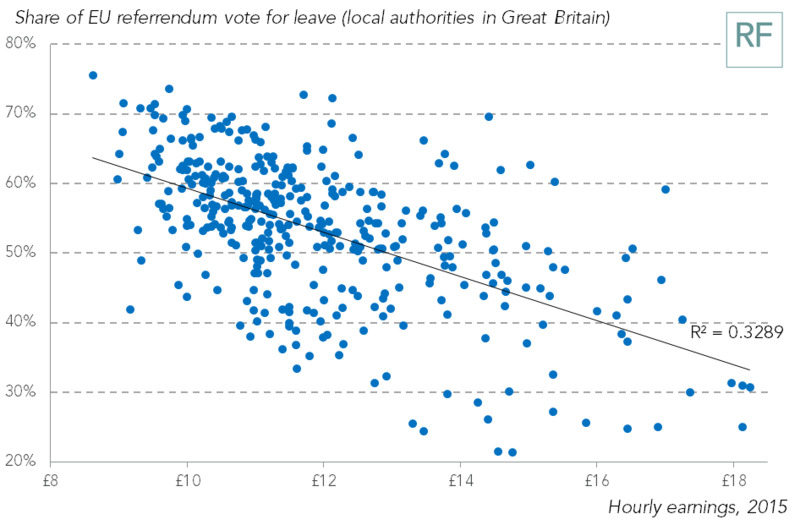 Simply put, poorer voters voted for ‘Leave.’ This is not to say one can argue that voting Leave is a decision made on sound economic grounds (i.e. an argument that the UK is better off, economically, separated from Europe than more integrated with it). It was not! But it seems poorer voters chose something different over more of the same. 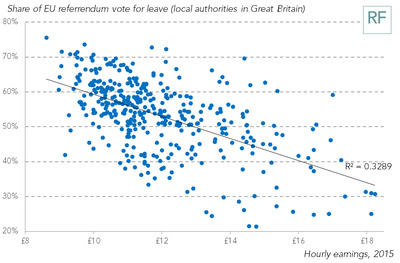 This is the key chart from Bell, which shows that areas with lower incomes were more likely to vote leave while a chart of income changes from 2002-2015 revealed no correlation between an increase in votes for or against a Brexit. In the US, this picture is a bit fuzzier. As Nate Silver has noted, the median Trump voter is wealthier than both the median US household and the median Clinton voter. That Trump’s support is middle-class, then, is a myth as much as the middle-class itself is becoming a myth. In this light, an Arnade-style argument that Trump voters are motivated by better economic prospects looks more tenuous. But voter motivations, as we’ve all found out in this current cycle, are fluid. Most of the discourse around why voting to Leave the EU is crazy seems to center on the idea that things will indeed change but that all of those changes will be bad. And it may be so. But in Arnade’s construction this doesn’t matter to the average Leave or Trump voter. They are already screwed. And, so much like Leave voters here in the UK, Trump voters have been fingered as merely ignorant and racist. As voters who don’t want a better future for the US but just want to see the world burn. For many of these voters, however, the world is already burning. Voting is the only power they have left. “Make America Great Again” plays on all the worst parts of Trump’s base. “Make American Anything Else” is less catchy, and it’s quite obvious why this doesn’t appear on hats. But this latter construction, in my view, more accurately captures what’s driving Trump in the US, and what just drove the UK out of the EU.